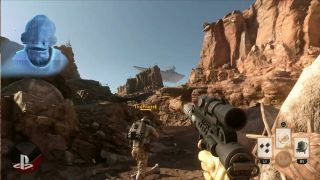 We've seen gameplay footage of Star Wars: Battlefront running on a PS4, and Wes had hands-on with the console build at E3, but the video embedded above shows the forthcoming shooter in action on PC. It's our first glimpse of the DICE-developed game operating on the platform, and while it's only a brief 30 second glimpse, it definitely looks like it works. EA Tweeted the footage earlier today, with the YouTube version above courtesy of TubeGameVideo. Wes enjoyed what he played, but noted it lacked the silliness of the older games. "Without that silliness, the simplicity of the new Star Wars Battlefront ends up feeling a bit shallow," he wrote.